On our next to last day of birding in Ecuador we woke up late (if I remember correctly we didn’t got on the road until after 6 AM) and headed to Cabañas San Isidro, an ecolodge on the east slope of the Andes, owned by the same folks who own Guango Lodge, but at a lower elevation, a bit above 2,000 meters. The grounds of the lodge are gorgeous, and we were quickly seeing bunches of birds, everything from Inca Jays to Blackburnian Warblers. Quite a few lifers came quickly: Russet-backed Oropendola, Pale-edged Flycatcher, Mountain Wren, and a Montane Woodcreeper like the one below among them. Eventually, we moved up onto an observation platform that is built onto the top of a recreation room and mostly just enjoyed the view because the birds were surprisingly scarce up there. Then it was another wander through the grounds until one of the guides from the lodge (whose name I have sadly forgotten) guided us down a short trail, hid himself behind a bush, and started tossing worms. It wasn’t long before we had spotted our third antpitta species of the trip, this one a White-bellied Antpitta. What a cool little bird! 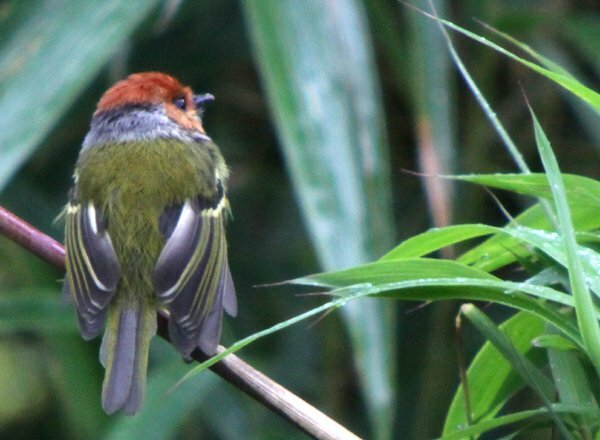 After the antpitta we did another quick circuit of the immediate grounds at the lodge and spotted more birds, Cinnamon Flycatcher, Brown-capped Vireo, Blue-necked Tanager, and the Rufous-crowned Tody-Flycatcher below among them. Then we left the grounds for a walk up the dirt road which was strangely devoid of birds. We saw a host of beautiful butterflies which will eventually get a post of their own, but the overall level of bird activity was downright disappointing. It might have been the strong sunlight or perhaps the fact that it was the middle of the day but the cause didn’t really matter: it was dead. Renato suggested checking the hummingbird feeders at the lodge, which we had not yet visited, and then making our way to a cloud forest at a slightly higher elevation to see if the birds would be more active there. We followed his advice and enjoyed the hummingbird feeders, which will also feature in a future post of their own, and then we drove up to a trail into the cloud forest where it turned out to not just be shrouded in clouds but raining. Hard. The tropics are weird that way in that a small change in location or elevation can bring a radical change in the weather. We tried to bird in the deluge anyway for about fifteen minutes and then gave up and went back to San Isidro where the hummingbird feeders were still humming with activity and where the Masked Trogon pictures that flank this paragraph were taken (those pictures, by the way, can both be enlarged greatly if you click on them). 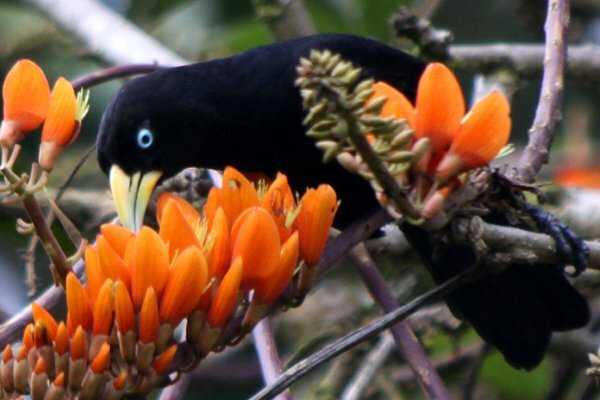 Eventually, when the bird activity slowed down again we decided to drive back to the trail where it had been raining, but were distracted en route by a nice foraging flock that included the Subtropical Caciques below. Our birding on Wednesday had ended with us picking through foraging flocks in a very thick fog that made every bird look like a mere shadow of itself. Color was almost nonexistent except for the green of the lush plant life. 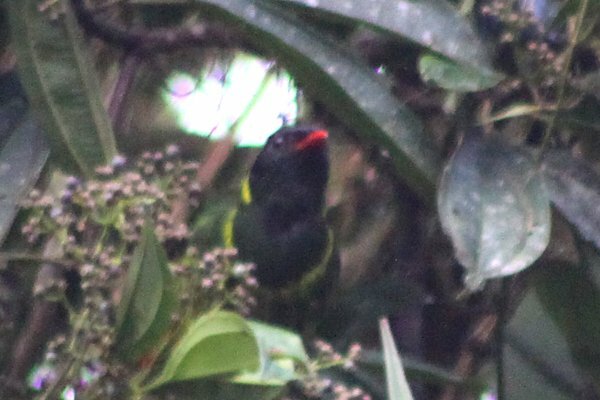 Despite the weather conditions and the fact that we were birding from a narrow trail with treacherous footing on a steep slope we managed to do rather well, and birds like Green-and-Black Fruiteater, Saffron-crowned Tanager, and Lacrimose Mountain-Tanager were all checked off the checklist. Then new birds stopped coming. At least, new birds that we could identify in the water masquerading as air stopped coming. The trudge back to the van was a downer, at least for me. Though I held out hope that one more new bird would show itself well along the trail or on the ride back to our lodging, I knew it was unlikely, especially when the fog finally stopped fooling itself and turned to rain on our ride. And that was it for our penultimate day’s birding in Ecuador. 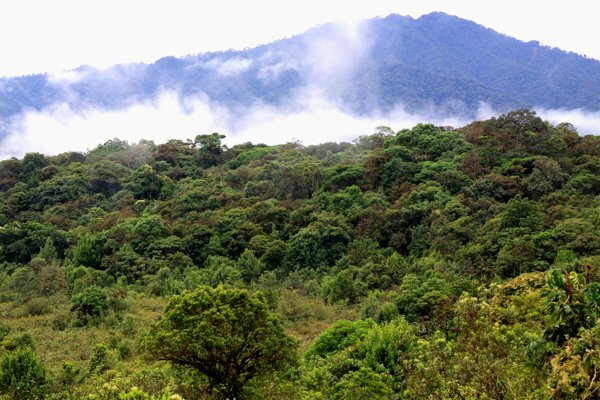 We had just Guango Lodge left, situated much lower on the east slope, before our expedition was done. Did the trogon fly in or just materialise? I have never seen one in flight, one moment an empty branch, blink, trogon. @Redgannet: We were actually driving out of the lodge when Renato spotted the bird…and it was a walk-away after we had drank it in for quite some time. 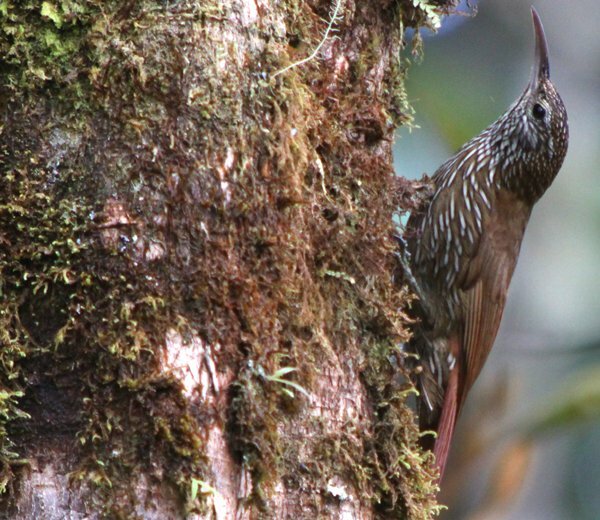 Congrats on getting a good shot of that Montane Woodcreeper. Members of that family are so difficult to photograph. Sorry to hear that you had a sunny afternoon- always a temporary death knell for birding in cloud forest.